Altiverb is a sampled acoustics processor that offers realistic one-, two- and four-channel sampled acoustics of real halls, cathedrals, bathrooms — and virtually any acoustic environment. Included in the release are dozens of presets ranging from the Amsterdam Concertgebouw to the back of a Ford Transit van, all of these can browsed online and downloaded from www.audioease.com/IR . Altiverb provides mono-to-mono, mono-to-stereo, stereo-to-stereo, mono-to-quad, and stereo-to-quad effects, making it ideal for surround reverb and ambience applications. All processing is done in real time. An Altiverb preset is called an 'impulse response', which is created by firing a starter pistol or by playing a sine wave sweep from a speaker in an auditorium, church, or other acoustic space. The resulting reverberation decay is recorded as a digital audio file. Using a process called deconvolution, the dry source signal is then extracted from the audio file, leaving behind the exact acoustic fingerprint of the space. The impulse response file is then placed in a folder, to make it appear as a preset inside the Altiverb plug-in, where it can then be applied to any audio signal as real-time reverb. The result is a true reproduction of the sound of the acoustic space. Unlike reverbs of the past, which attempt to synthesize decay characteristics, Altiverb captures the actual acoustics of a particular environment. Altiverb includes the Impulse Response Pre-Processor software, which allows users to sample any acoustic space, hardware reverb, or other source to create their own Altiverb presets. In addition, users can take photographs of the place they are acoustically sampling, and place JPG images in the same folder. Altiverb then displays the JPGs as a slideshow when the preset is chosen in the plug-in. In addition, these pictures can show mic positions and other details of the sampled space. Free Altiverb 7.1 update features the all new AAX 64 bit plug-in for Pro Tools 11, upgraded graphics for retina displays and a 64 bits MAS plug-in for Digital Performer 8. Removed the deprecated parameter ‘snapshots’ from automation lists, added a warning in the snapshots screen (you need to use Automation Preset Index, please see http://youtu.be/BmkzrkdY6bY). Altiverb 7.0.4 enables downloading new IRs directly from Altiverb. improved: IR loading time in TDM has been reduced. fixed: IR not found errors. The extension matching is case sensitive. .L and .R extension are found now. fixed: Similar did not work on User IRs. Now it compares to Audio Ease IRs only. fixed: crash in VST version at session load when IRs can’t be found. fixed: VST version did not show the additional channel volume controls in XL version. fixed: Drag and Drop in VST (mainly Cubase and Nuendo) did not work. improved: mono-mono instance of Altiverb can load any IR (also multi channel). improved: loading of host plug-in presets is faster. fixed: an issue in Pro Tools when track automated "Automation Preset Parms" aka Snapshots where used in conjunction with other parameters. fixed: the installer would crash when it finds strange characters. fixed: the interface for offline processing in Digital Performer is on the wrong position . fixed: Pre delay could reset itself. fixed: drag import of AIFF files would not work correctly in 64 bits versions. fixed: hang when drag import split files. fixed: pre delay of notes gets changed when tempo changes exists in a song. several smaller fixes and improvements. If you close a VST song while the Altiverb browser is open (and a category is selected) you may experience a crash. This is after song save though, it should be harmless. The same goes for host application quit, as that closes the song as well. In some situations the IR Browser window does not open in Digital Performer. The IR library is more accessible then ever because of Altiverb's new visual browser: quicker loading, organize-by-size, and single click favorites. The room does work, but it is not quite the perfect one yet? Hit Similar and Altiverb will suggest similar sounding alternatives to the chosen impulse response. Altiverb supports 64 bits. It has a new reverb gate, and straightforward pre-delay and attack parameters. Times can be set in note values locked to your song's tempo, and you have 10 times as much space in the stage positioner. This update adds compatibility with Mac OS X 10.7 (Lion). * [ALL] dry/wet mix settings are restored correctly (after a bug introduced in 6.3.3). * [ALL] update reduces memory footprint by 30 to 50 % !! * [TDM] The mono to stereo 1 second accell chip TDM plug-in could crash, as well as a similar surround instance. This is fixed. Extensive optimization resulted in reduced CPU loads. Major rewrites have enhanced overall stability of Altiverb. When run in sessions higher than 48 kHz, when applying delays in early refs and tail errors in assembling the final IR could occur. This is fixed. Fixed problem in the naming of Altiverb presets. [PT] flatter cpu load within Pro Tools systems, reducing "CPU held off too long" -messages. [PT] fixed problem when using automation presets. [TDM] Improper load of settings removed. [PT PC] Altiverb TDM instances now map properly to Altiverb Regular counterparts when no XL authorization is found. [MAS] when "Reset All Parameters" is on, a song load does not delete all settings anymore. [AU] After "rescan IR folder" Altiverbs interface remains functioning properly. [PC] compatibility with Sequoia, Samplitude and Sonar improved. [PC Pyramix] silence at start of non-realtime mixdowns fixed. [PC Pyramix] surround mapping of output channels is now compatible. [PC Pyramix] integration with mascore completed. [VST] fixed mono-mono IR selection problem. [PT] Pro Tools 7.4.2, OS X 10.5.3 and Intel Mac compatible. The RTAS version has been fixed to work with optimal performance in Mac OS X 10.5.3 and Pro Tools 7.4.2. Earlier there was the need to exclude some processor cores from RTAS processing, the playback engine can now be set to the number of processor cores available. [PT TDM] The TDM version has a fix to make reloading a session with several Altiverbs active reliable. Data traffic to and from the DSPs could be hampered during load of a session, especially with an Expansion Chassis (ethernet or Magma) is connected. The fix makes the traffic reliable, albeit on a chassis somewhat slower. [PT ]The RTAS version has been made better compatible for exchanges between PC and Mac, and between HD and LE systems. A session with a TDM version inserted will now open an RTAS instance automatically when transported to an LE system. Due to necessary improvements in the handling of VST automation data we have been unable to maintain automation in sessions made with Altiverb VST version 6.1.2 or before. Typically: gain knobs left at 0 dB in 6.1.2 or lower appear as +13.2 dB in Altiverb VST 6.2.0. This only goes for automation data. regular saved settings appear fine. Pyramix useres will see this in the loading of regular settings from sessions as well. [VST] Tails properly cleared when resuming playback from stopped state (Wavelab, Sequoia, Samplitude, and others). 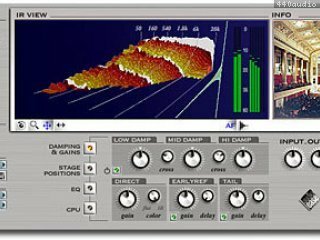 [VST] Compatible with Cubase 4. [VST] Remembers correctly its saved IR. [VST] Fixed problem with certain V-STack/audio interface combinations. [PT] some improvements to RTAS buffer system. Special characters in file path for installer are allowed now (solves the error 5505 on install). Altiverb 4.2.8 AudioUnit fixes a problem with initializing on a system with an incomplete set of IRs. Altiverb 4.2.7 problem with loading Altiverb 3 settings in all hosts. Altiverb 4.2.7 HTDM fixes a problem with plug-in shuffling. Altiverb 4.2.7 HTDM and RTAS Bypass is automatable. Altiverb 4.2.7 HTDM and RTAS improvements according to latest Digidesign specs. Impulse Response menu misbehaved when used with two monitors. High latency setting on a G5 used a wrong gain setting. Resolved problems when showing two Altiverb interfaces (RTAS or HTDM) in Pro Tools. Added passing of channel configuration info to Audio Unit and VST hosts. Small fixes in installer application. Pas trouvé meilleur à ce jour. Excellente reverbe à convolution, résultats étonnants, de la profondeur, de l'ame, j'adore.